BARB’s TV Player Report is the UK’s first joint-industry, audited measure of viewing to online TV and reports on the consumption of TV content on PCs, tablets and mobile phones from data generated by software code embedded in TV player apps. These are census data, not panel data – providing a measure of total viewing across devices by all users of the players, not just by BARB panel members. Viewing on devices has been much talked about in our industry and is conspicuous because it’s often being done in public or on the move, leading to a belief that it might be higher than it actually is. In fact, the vast majority of viewing time is still happening on the TV set; our data show that total viewing time on devices adds approximately 1.3% to total TV set viewing levels. Looking specifically at the share of online TV viewing by devices, we can distinguish between BBC iPlayer viewing via smartphone apps, browser-based access and via the iPlayer app on connected TVs. Our data show that 50% of all iPlayer viewing in 2017 was via connected TVs and this proportion appears to be steadily growing. With connected TVs now available for 66% of individuals in TV homes (according to BARB’s Establishment Survey), it makes sense that people will view online TV content on the biggest and best available screen. 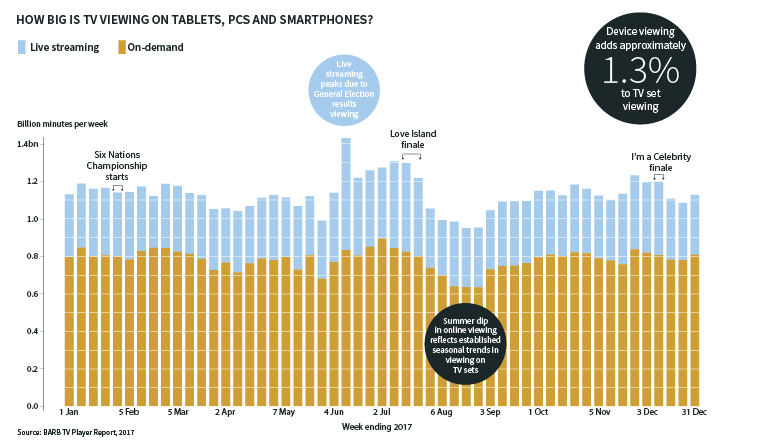 The iPlayer data on viewing behaviour are consistent with data about which devices people prefer for certain activities. In Deloitte’s Mobile Consumer Survey 2017 (see Ed Shedd’s guest essay), the TV set was the preferred screen among all age groups for watching long-form content. The chart breaks down total viewing to distinguish live streaming from on-demand. It shows that viewing on-demand accounts for the vast majority, but particular events, such as the UK general election, drive spikes in live streaming. Because on-demand represents people having total control over what, when and where they watch, it’s not surprising that the biggest programmes are the most popular, talked-about ones, across genres (see Top On-Demand Programmes and Top Live Programmes). Drama (Three Girls, EastEnders, Doctor Foster, etc) dominates the top on-demand rankings along with event TV (The Apprentice, I’m a Celebrity and the Channel 4 debut of The Great British Bake Off); with big numbers also for one-off documentaries (Rio Ferdinand: Being Mum and Dad), natural history (the Blue Planet II debut) and entertainment reality (Love Island, Made in Chelsea, The Only Way is Essex). In fact, Love Island would have dominated the on-demand and live charts if every episode had been treated separately. If the top on-demand programmes table represents the content that people can’t bear to have missed, the top live programmes table tells us what they’ll make an absolute priority for. Dominated by big football games, rugby and Grand Prix racing, it’s again not surprising to see Love Island and I’m a Celebrity in the top 10. We see that exceptional drama series like Doctor Foster and Liar can command a live streaming audience too – as well as a different kind of unmissable live drama in the form of the General Election exit poll, which commanded big live-streaming numbers from 10pm on election night. So online viewing seems to reflect two need-states that TV satisfies in us: the edge-of-the-seat live experience and the relaxed personal viewing appointment. Let’s now see what we can discover about when and how people are doing this online viewing.